In advance of any potential severe weather warnings this term, this letter outlines the arrangements that we have in place. The school will be open as usual unless a decision is taken that it is deemed unsafe to do so. The Gatwick School would formally like to invite you to your son/daughter’s Year 11 Parents Evening on the Wednesday 12th December 2018. This evening will be a great opportunity for you to speak to your child’s subject teachers. As we all know Year 11 is the most important year and many of our students have returned with a more focused attitude towards learning, which I hope has been reflected in their mock results. However, their journey does not stop here and we must look towards their next goal whether this be college applications or apprenticeships or the January Mocks. We want to guide and support your children through this most important year and therefore your backing is an integral part of this journey. On the evening of the 12th of December there will be a short presentation to parents which will highlight different ways to support your child at home with their revision for exam success. This will be half way through the evening at approximately 6:10pm which allows time for you to speak to teachers before and after, clarifying and making clear the bespoke revision tools your child has at their disposal. Your appointments will start from 5.00pm and the evening will come to a close at 7:30pm, including the short presentation at 6:10pm. The evening will be an invaluable insight to your child’s progress on where they are now in their journey but the steps they need to take before the summer exams, which is why it is of the utmost importance that we have all parents/carers attending this evening. There will be no after school clubs or wraparound running on this day. We hope you have an enjoyable and restful Christmas and New Year break, we will look forward to receiving your children back to school on Monday 7th January 2019. I would like to take this opportunity to let you know, that school will also finish early at the end of the Spring Term (Friday 5th April 2019), and the end of the Summer Term (Tuesday 23rd July 2019). Further details and confirmation of timings will be sent closer to the time. Thank you for your continued support for The Gatwick School. At the end of this school Term, Mr Mitchinson will be leaving The Gatwick School. He has chosen to leave teaching for a period of time. I am sure the children will miss Mr Mitchinson and his positive, fun attitude to learning that he has included in his teaching. From January 2019, Peacocks class will be taught by Miss Charlotte Goswell. She is an enthusiastic professional, has huge passion for Early Years and is a trusted member of staff. Miss Goswell has worked with The Gatwick School for over 4 years as a Teaching Assistant and is on the final stages of her Early Years Degree. Miss Goswell will complete this qualification over the Spring and Summer term and she will take up a Trainee Teacher position in September 2019. Throughout this transition, Miss Goswell will have an experienced in-school mentor to support her career development. Miss Goswell will commence some Peacock’s transition lessons this week so that the children are fully familiar and comfortable with her when the new term commences in January. Mr Mitchinson will remain in the classroom working with the children alongside Miss Goswell to ensure a seamless transfer of responsibility. We would like offer an opportunity to get to know Miss Goswell and have organised a ‘meet and greet’ session with Miss Goswell before the end of term from 220-250pm on Wednesday 5th December 2018. I would be grateful if you could email smitchinson@thegatwickschool.org.uk if you would like to attend this session as we will be providing some light refreshments. We are very excited to announce that we are organising a four night, five day residential trip to Seville, Spain, in July 2019. During our stay in Seville, the students will get the chance to experience Spanish language and culture, away from beach resorts. Students will go on a day trip to Cordoba, visit the city, the local cathedral and its world-famous Mesquita, which houses artefacts and relics. The trip is a Spanish immersion experience, where students will be encouraged to speak in Spanish only, to the best of their abilities. By combining many National Curriculum-linked modules of GCSE Spanish with thrilling outdoor and indoor activities, this trip is sure to provide your child with a wealth of new language and cultural experiences outside of the classroom, while at the same time providing at least an hour a day of organised Spanish lessons at 3 different levels of proficiency. Residential courses organised by the school are, of course, an optional but rewarding part of the National Curriculum. Pupils benefit hugely from the experience, both educationally and socially and we feel certain that this Rayburn Tours trip, which we have chosen this year, will prove to be both enjoyable and very worthwhile. We would like to offer this opportunity to children from the secondary phase. Year 7-10 are invited to go, but there are only 40 places available, to be confirmed upon receipt of the deposits. The trip will take place from 30th June to 4th July 2019. We have worked hard to ensure the best deal possible. The cost of the trip will be approximately £480 and includes return plane tickets from Gatwick Airport, half-board accommodation and a full programme of activities. To confirm our booking, an initial non-refundable deposit of £160 will be required by Monday 3rd December 2018. Please complete the attached form and return it to the School as soon as possible, confirming that your deposit has been paid via Parentpay. Please note that poor conduct in school leading up to the trip may result in your child’s place being withdrawn and your deposit being lost. There is always the option of paying the total as a lump sum. This term we have a beautiful 5ft Nordmann Fir Christmas Tree in the front of B Block reception area. This has been supplied by Sussex Garden Craft who are selling Christmas Trees which can be delivered to you at school in December. Sussex Garden Craft will donate a portion of their profit from selling Christmas Trees back to the Friends of Gatwick School which will benefit the children’s school life. To order your Christmas Tree please use the form attached and return it to school with the money in a named envelope by Friday 23rd November 2018. All trees will be delivered to the school netted so that they will fit in the car. They will be available for you to pick up from school, from Tuesday 4th December. FOGS present a Drop ‘n’ Shop Christmas Party for Years 1 to 4 on Thursday 29th November. Get your tickets early to give your kids a brilliant evening while you get some shopping done. On Thursday 15th November we will be holding our annual Primary Phase Open Evening for prospective Reception students and for any other children applying for a place at The Gatwick School. The evening will run from 5.00pm to 7.00pm. This is an important event for us and we have taken the decision that our Primary Phase students (Reception, Year 1, 2, 3 + 4) will depart from school earlier, 2.10pm for Reception, 2.20pm for Year 1 and 2 and 2.30pm for Year 3 and 4. There will be no ‘Wrap Around’ for Primary Phase children on Thursday 15th November. Secondary Phase students (Year 7, 8, 9, 10, 11) will depart from school earlier at 3.50pm. The earlier departure of students will enable staff to prepare all classrooms and learning areas across the school, in order to showcase the excellent teaching and learning that takes place in our school. On Friday 16th November, both Secondary and Primary Phase students will commence the day as normal. I apologise for any inconvenience caused and thank you for in advance for your support. The Friends of Gatwick School (FOGS) would like to invite all year 7 students to a Start of Year Mixer Disco. This event will be just for the year 7 students and will allow them to mix and form friendship groups in a social setting. On Tuesday the 2nd October we will be holding our annual Open Evening for prospective new Year 7 students and any other children applying for a place at The Gatwick School. The evening will run from 5.00pm to 8.00pm. This is always an important annual event for us and as such we have taken the decision that Secondary Phase students (Year 7, 8, 9, 10, 11) will depart from school at 1.50pm immediately after lunch. This will enable staff to prepare all the Secondary classrooms and learning areas in both Block A and Block B, in order to show case the excellent teaching and learning that takes place in our school. Our Primary Phase students (Reception, Year 1, 2 + 3) will depart from school earlier, 2.10pm for Reception, 2.20pm for Year 1+2 and 2.30pm for Year 3+4. There will be no ‘Wrap Around’ for Primary Phase children on Tuesday. 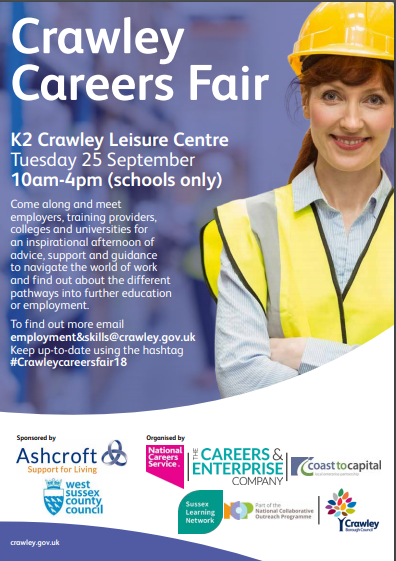 On Tuesday 25th September there will be a Crawley Careers Fair held at K2 Crawley Leisure Centre. Year 10 students will be given permission to attend this event. An afternoon time slot has been booked for them between 1.45-3.45pm. We will therefore let them depart from school at 1.00pm on the day, in order to give them enough time to make their own way there. Pupils can only attend with your permission, and on the understanding that they are attending the event. School staff will be at the event to monitor attendance. Our clear expectation is that any Year 10 pupils who do not want to attend, will remain in school and continue with the rest of the school day as normal. There will be a large number of employers and further education providers in attendance at the event along with the National Careers Service and West Sussex Careers Advisors, there will also be several current Apprentices on hand to discuss their experiences. We feel this would be an excellent opportunity for our pupils to learn about the range of options open to them while continuing their journey to success. There is no charge for this event. Year 10s have an arrival time slot of 1:45. If for any reason they cannot attend, absences will have to be communicated to the school as normal. We look forward to sharing this exciting opportunity with your child. On Tuesday 25th September the event mentioned here is taking place in Crawley at K2 Crawley Leisure Centre. Year 9 students will be given permission to attend this event. An afternoon time slot has been booked for them between 12.45-2.45pm. We will therefore let them depart from school at 12.00pm on the day, in order to give them enough time to make their own way there. Pupils can only attend with your permission, and on the understanding that they are attending the event. School staff will be at the event to monitor attendance. Our clear expectation is that any Year 9 pupils who do not want to attend, will remain in school and continue with the rest of the school day as normal. There will be a large number of employers and further education providers in attendance at the event along with the National Careers Service and West Sussex Careers Advisors, there will also be several current Apprentices on hand to discuss their experiences. We feel this would be an excellent opportunity for our pupils to learn about the range of options open to them while continuing their journey to success. There is no charge for this event. Year 9s have an arrival time slot of 12:45. If for any reason they cannot attend, absences will have to be communicated to the school as normal. We look forward to sharing this exciting opportunity with your child. Students have been granted booked time slots to attend the event. We will therefore be collapsing the school day to ensure attendance at this unique and invaluable opportunity. Year 8 Students do not attend school. School staff will be at the event to monitor the attendance. Our expectation is that all students will attend. The fair has been agreed by local schools, businesses and colleges to provide the highest quality of careers provision for your child. There will be a large number of employers and further education providers in attendance along with the National Careers Service and West Sussex Careers Advisors, there will also be several current Apprentices in attendance. We feel this would be an excellent window for our pupils to learn about the range of options open to them while continuing their journeys of success. Year 8s have an arrival time slot of 11:00. If for any reason they cannot attend, absences will have to be communicated to the school as normal. Students have been granted booked time slots to attend the event. We will therefore be collapsing the school day to ensure attendance at this unique and invaluable opportunity. Year 7 Students do not attend school. Year 7s have an arrival time slot of 10:00. If for any reason they cannot attend, absences will have to be communicated to the school as normal. Your child has successfully submitted their completed first draft coursework. I aim to mark the coursework with feedback the same day and give it back for editing the next day. The following dates are available for your student to ask questions and have me present for the editing process. It should not take long as there will only be a certain amount of adjustments that I can offer. All will be held in the A block computer area, just outside the drama studio. I am writing to you in order to update you on Drama coursework. So far I have not received your child’s completed coursework and they have not attended the after school catch up classes that I have offered them. We cannot dedicate any more school time to the completion of this coursework due to time restraints within the timetable this year and so coursework must be completed in these catch up sessions. Please let me know via email (address below) which session/s your child will be attending so I can plan for them in order to get the most out of the session.